This sculpture, designed by Tony Crosse the hospital's healing arts consultant, is made from a London plane tree. It was probably planted in 1905 when the original Royal Naval hospital was built and was cut down in 1997 to make way for the Hydrotherapy Unit which opened in 1999. The trunk, weighing approximately two and a half tons, was sliced into four inch wide planks which were then left to dry naturally for four months before being shaped, jointed, sanded, assembled and lacquered. Accompanying the Seat of Healing is a hand-made book which holds the signatures of everyone who has sat in it and felt their spirits raised, their problems diminished or an overall sense of well-being. If you sit in the seat please ask to sign the book as a record of your support for healing. A large London Plane tree was felled on the hospital site as part of ongoing redevelopment, and I decided to use this ‘on-site’ material as a way of illustrating the broader aspect of ‘healing’ the environment through recycling. 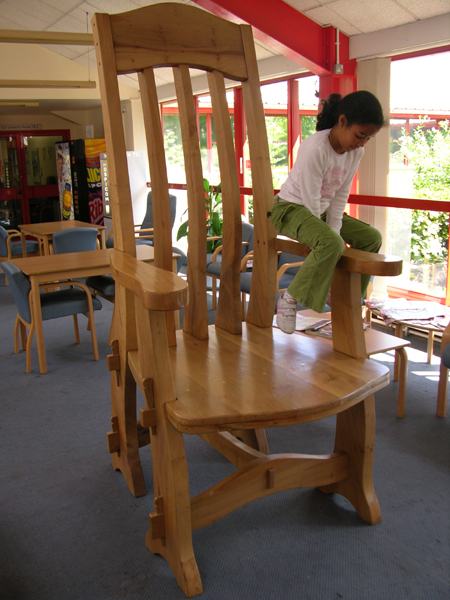 The idea of a ‘giant’ chair-sculpture was appropriate for both the Reception area and the amount and size of timber available. The ‘ordinariness’ of the art object would encourage public interaction without the self-consciousness that can sometimes accompany the viewing of ‘art’. I drew up plans and constructed a full-scale cardboard model, then invited local timber and joinery firms to transport the trunk, cut and treat the wood, and assemble the chair free of charge as an active contribution to the Programme. 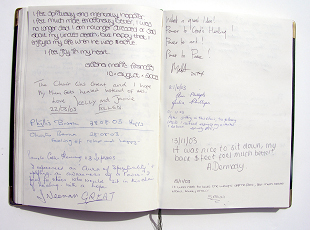 The chair was waxed and polished and a hand-made guest-book provided for people to record their thoughts. Features appeared in local newspapers. A local sports club asked to ‘borrow’ it for a charity event in exchange for a substantial donation. It was featured at the end of local television news as their ‘good news’ item.